Home » KMTC Kenya » Is the KMTC Nyeri administration taking over the student body? Is the KMTC Nyeri administration taking over the student body? 16th May 2014 will be the time when KMCT Nyeri students will go to the ballot box to elect their leaders. Various students have emerged to contest for the posts of Chairman, Vice –Chairman, Secretary, Treasurer, Organizing Secretary, Commissioners for: Sports, Catering, Accommodation, Public Relation, Academics, Gender, Security and Health. Kenyayote campus team has been investigating why aspirants Tyson Wabuti and Ocean Kibet Fabian stepped down. Inside sources now reveal that the two stepped down due to fear of being victimized by the administration. 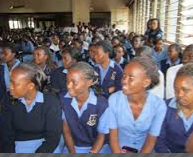 The administration of KMTC NYERI seems to have taken over the students’ body which is against the students’ body constitution which indicates that the administration has no power over students’ body affairs and….. it should not interfere with the students body activities. It has also been revealed that several contestants who were against the administration’s governance have been blocked from vying which is a violation of the constitution of the students’ body of KMTC. A section of students have therefore threatened to take legal action if that is not going to stop. Do you have inquiry or comment about KMTC elections? let us know through our Facebook page.